Bali is an incredible country to visit. Many dream about traveling to this tropic destination but everyone should make the moves to get themselves here! Bali is great for solo travel, romantic getaways, and our favorite – family travel. 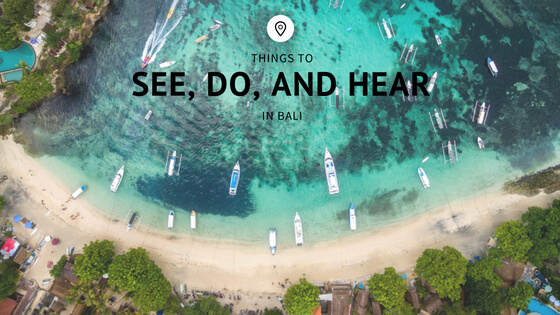 There are many things to do in Bali but here are just some of my favorites. If you’re thinking of the picturesque-Bali, the white sandy shores of Balangan Beach is where you want to go. The beach is located along rocky cliffs but has many palm trees. There are many cafes and surfer bars in cute shacks along the sand that give you a real island feel. Head to the north part of the beach to discover its small, historic temple. If spending the day at the spa is your ideal way of vacationing, check out the Taksu Spa. This spa is heavily focused on yoga practices and an extravagant menu of treatments. Book a couples massage or sign up for one of their many classes. After, enjoy a fresh smoothie in their healthy cafe. As I heard, due to their popularity and high demand, they will be expanding into more locations soon! The top hotel in Bali is the Katamana, located just over a half mile from the center city. The artful design of the structure is something to marvel at. The building was designed by Andra Martin, a famous Indonesian architect, and it features many indigenous materials. The 58 suites all include large window, private terraces, and seating areas. The best times to hit a good swell in Bali are between the months of June and August. If you’re looking for a shallow beach and fellow surfers to join you out in the water, be sure to visit Padang Padang, just one Padang for short. There are a few places that will put you up along the shoreline where you can watch the wave breaks from your balcony. As with all surfing locations, be sure to check the swells before venturing out to avoid anything particularly nasty.